It's funny but for such a diabolically clever series that has introduced us to so many new victims, eccentrics, and killers that keeps Midsomer Murders running so strong, thirteen years well after it began, I couldn't really tell you more than a handful of details about its main character DCI Tom Barnaby (Tom Nettles) and absolutely nothing about his hardworking assistant Detective Sergeant Ben Jones (Jason Hughes). Yet, give me a few details about any given crime I've seen and I can tell you the entire plot-- whether or not I've entirely wrapped my mind around it or not-- as the ingenious twists and confounded cases often make Barnaby and Jones blend in with the background into the picturesque countryside by comparison. Originally based on and now inspired by the village murder mysteries of Caroline Graham, the fourteenth set of slim-packaged DVD mysteries offers fans four more frightfully clever set-ups for foul play and countryside mayhem run amok but luckily this time around, a few of the cases manage to impact Barnaby’s life in ways that are more than just professional. Tossed off an assignment by a “desk pilot” who is more obsessed with planning his wedding than catching a killer, in “Picture of Innocence,” Barnaby gets far more than he bargained for when his ever patient wife Joyce manages to drag him out of the house to a photography exhibition where a doctored photo of him locking lips with an ex-girlfriend just so happens to be on display. Trying to convince Joyce that he’s the victim of the digital revolution is one thing but when more bodies start piling up among the Midsomer shutterbugs whose club is filled with animosity in the war between film and pixel, Jones realizes he is going to have to prove his colleague is innocent all on his own especially when the murderer(s) are planting evidence that all points to our favorite DCI. Yet, thankfully for fans and Jones, Barnaby doesn’t go to the bench without conducting an investigation of his own, as he and Jones keep each other filled in every step of the way against orders but in pursuit of someone closing in as more camera-wielding villagers wind up posing as corpses. 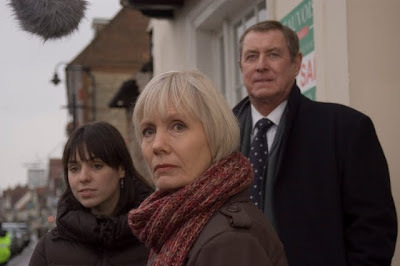 One of the two strongest cases, following the set’s opener “Death and Dust” that finds a village doctor dead, only for us to realize that the wrong victim was plowed down on the road, Midsomer is in top form in its ambitious “Dust” which showcases the breathtaking scenery to best effect and works in so many twists, you’ll almost need a piece of paper to map everything out once the old standbys of money, love, and revenge get inserted into the case as possible motives. In the goriest yet all too familiar offering, “They Seek Him Here,” the detectives find themselves in a classic case of “too many suspects” as the loathsome director of a new, low-budget version of The Scarlet Pimpernel gets beheaded by his own prop that works much better than the set masters assumed. Far too similar to numerous other titles that occurred at music festivals and the like, all rolling-heads aside, “Seek” is the British version of Murder, She Wrote in the box. 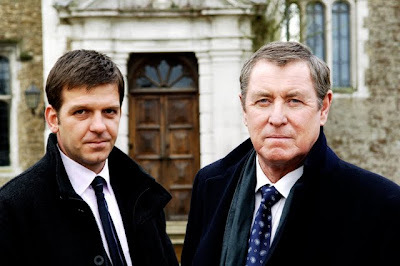 Luckily however, it’s the only true dud as the slow-paced yet truly surprising “Death in a Chocolate Box” gives viewers the second chance to learn a little more about Barnaby when two of his old colleagues find their halfway house jeopardized by scandal and deadly secrets from the past. Although it’s hindered by the fact that it takes a good forty minutes to get viewers involved in what will turn out to be the ultimate plot, it delivers one hell of a baffling payoff and likewise includes a nice personal touch as the events coincide with happier news for Barnaby’s daughter. Criminally good for the most part thanks to the high quality cinematography and writing, while I can only wish that we would’ve had the pleasure throughout the years of getting to know our dynamic duo much better than simply following them vicariously throughout each villainous village tale, set fourteen manages to get us more emotionally involved than previous editions thanks to the outstanding “Picture of Innocence” along with two other highlights from 2207-2008’s tenth season.